Only the Prague-based Uzbek language service of the RFE/RL was the only mass media to report on the incident. No print or electronic mass media outlet in Uzbekistan reported on the boy’s tragic death. Perhaps one could it say it was just a tragic accident. Maybe it was. 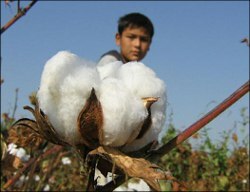 However, no such thing would have occurred if the human life were valued in Uzbekistan: farmers would work on cotton fields, not students and state employees, who are summoned to cotton fields in hundreds of thousands every year, not schoolchildren, not breastfeeding mothers who have to take their infants to cotton fields. Uzbekistan has been successfully implementing this practice since the Soviet Union times. And it was perfected into virtual slavery of millions of citizens following after the independence in 1991. Reportedly, the local prosecutor’s office has launched in an investigation into the child’s death. He has been buried. His father was unable to say goodbye to him because he is breaking his back in Russia. This father is a “gastarbeiter,” as Muscovites indignantly put. According to Ozodlik, this is the third child victim of this year’s cotton campaign. On 16 Sep 2013, a fourth-year student died in a fistfight in central Uzbekistan. In another accident on 9 Sep 2013, a 16-year student was killed by an exposed live electricity cord, which she accidentally grabbed fearing she would fall into a water ditch.